Saturday evening, we were at the home of my mother-in-law, whom I call Belle Maman. (I’m sure that to a French speaker like her, that name seems completely banal, but I just love that “mother-in-law” in French translates to “beautiful mother” in English. But I digress.) Anyway, before dinner, I was occupied with the kids: my 6-year-old niece Tiphaine and my 4-year-old nephew Romain. The more I get to know her, the more I think Tiphaine is a little like me personality-wise. She likes to play school, and she’s very good at playing the teacher. After searching for some paper and a pen, she instructed me to have a seat at the desk and draw something for her. No specific instructions, just something good. I reflected for a little while and, thinking ahead to our evening plan, I decided to draw a bateau mouche on the Seine, with a row of Paris apartment buildings along the quay and the Eiffel Tower in the background. Tiphaine collected my assignment, reviewed it with me and approved it, applied some correction tape to the back of the paper in a very official, administrative manner, punched two holes at one end with a hole puncher, and filed it away … and then instructed me to draw another scene. After a little more reflection, I decided to draw Washington, DC, complete with the White House, the Capitol building, and the Washington Monument. It was another successful assignment. I think I even got an A.
I turned and saw that Tiphaine was pointing to the Basilique du Sacré Cœur, the basilica complex at the highest point in Montmartre. We chuckled a bit at that. 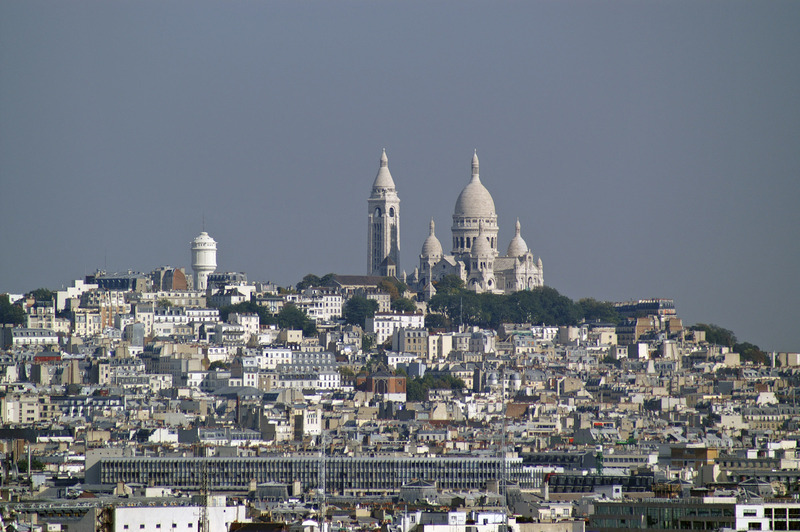 I guess the dome of Sacré Cœur does look a little bit like the Capitol dome, and the bell tower does look a little bit like the Washington monument. A reflection on my rusty drawing skills, or the product of a child’s rich imagination? In any case, it was one of those little magic moments that I won’t soon forget, and hopefully one that Tiphaine will remember when she and Romain come for a visit in Washington, whenever that might be.